SANTA FE, N.M.- Objects of Art Santa Fe, the first of three shows and two auctions offering antique and vintage fare in advance of the nearly century old Indian Market, got underway Thursday, August 10 at El Museo Cultural. 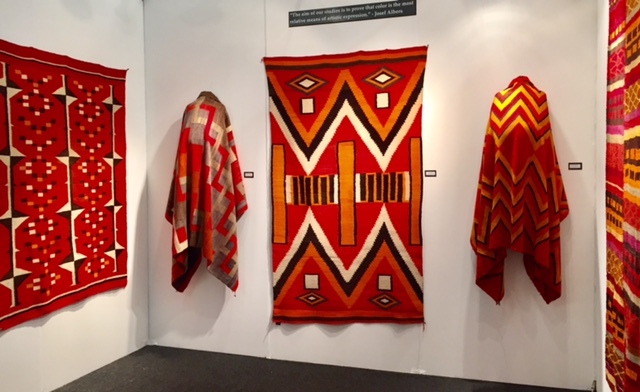 Pairing dazzling Native American weaving with Modern and Contemporary art, Sublette Medicine Man Gallery’s special presentation “Homage to the Square” set the tone for the show, a chic, colorful, diverse presentation of Taos and Santa Fe school painting, tribal arts and imaginative art to wear. Objects of Art Santa Fe continued through August 13. It is followed in the same space by the Antique Indian Art Fair, August 15-18. Both events are produced and managed by Kim Martindale and John Morris. Watch for complete reviews.